There are basically two forms of mortgage:Interest Only and Repayment. There are however different types of each of these in the mortgage market today. Outlined below is a brief description of each type. This website sets out to provide you with general information only and does not in any way offer or intend to give you advice or recommend any specific investment or financial product. With this type of mortgage the loan is not paid off at all and interest will be payable on the total mortgage amount for the duration of the mortgage term. With this type of mortgage you will need to be paying into an investment that has the potential to grow into a sum large enough to pay off the mortgage at the end of the term. Tax efficient investing in shares and/or unit trusts. Growth is tax free. Dividends are now taxable. No early redemption penalty if the plan is cashed in before the end of the mortgage term. Lower charges. Very tax efficient with relief at highest rate on all payments into the fund. Life assurance cover included. Not suitable for everyone. Contributions are paid into a pension scheme. At retirement age, the tax-free 25% lump sum is used to repay the mortgage loan and the remainder of the pension fund used to buy an annuity providing a pension for life. There are disadvantages with this type of mortgage because it uses one investment to cover two different financial objectives. These were very popular in the late eighties. They provided life assurance and were designed so that at the end of the mortgage term, the investments and income would provide tax-free lump sum sufficient to repay the mortgage loan, with the possibility of a surplus left over. However low inflation coupled with poor growth rates have left many people facing shortfalls having been mis-sold this type of mortgage. There is no guarantee that the investment will grow sufficiently to cover the mortgage. If surrendered early, you are likely to get back less than you have paid in due to front-end charges and commissions. Endowment mortgages do not now have any tax benefits. With any of the above it is essential you seek independent financial advice from a qualified and regulated financial advisor. With this type of mortgage you pay interest on the outstanding balance and repay some of the mortgage loan with each payment. In the early years the payments are mostly interest but the interest reduces over the term. A variable rate mortgage is one of the most common and simplest mortgages. The interest rate charged reflects changes to the Bank of England base rate. Although in recent years this has been fairly constant with just quarter point changes each month, historically the rate has changed by several percentage points in a single day. This may make it difficult to budget as monthly payments can vary depending on the general economy. A tracker mortgage "tracks" the Bank of England base rate against the interest rate the borrower pays. This is guaranteed never to rise more than a stated percentage above the BoE base rate. This type of mortgage gained in popularity when borrowers became increasingly aware that their mortgage rates went up immediately the base rate increased, but came down slowly and not in full when interest rates were cut. This type of mortgage makes use of the funds in your current account and can also be linked to other savings accounts. The available funds in these accounts are used to reduce the outstanding mortgage balance thus reducing the interest charged on the mortgage. However the money in these funds is still available to withdraw as with a normal current or savings account. The advantage of this type of mortgage is that the interest saved is usually higher than the interest received on savings accounts. It also has the added benefit that the interest saved is not taxable, as is the case with non-Isa savings accounts. A significant amount of money on interest payments is saved over the term, which can enable the mortgage to be repaid earlier. However, interest rates for this type of mortgage are usually higher than other repayment mortgages. As with Flexible mortgages, it is possible to make lump sum overpayments or take out additional loans. For Offset Mortgage information and Calculator Click Here. Capped rate mortgages cap the rate of interest charged on the loan to a set level, usually in line with Bank of England interest rate. It will not rise above the capped rate and will not fall below a certain rate. As with fixed rate mortgages there is an arrangement fee and early redemption penalties apply if you change lenders. This is predominantly targeted towards first time buyers. A lower or discounted rate of interest is charged during the early years, which may be convenient if you are financially stretched. You must be aware that some lenders add the interest saving to the outstanding loan. Again there are early redemption penalties, which can extend beyond the discounted period, tying you to the lender’s standard variable rate. This mortgage starts on a variable interest rate but allows you to switch to the lender’s fixed-rate deal at anytime without incurring early repayment charges. Also known as "switch to fix" but be aware you have to pay another arrangement fee when changing despite having already paid one for the first mortgage deal. Some standard variable rate mortgages offer a 'cash back' when the mortgage is taken out. 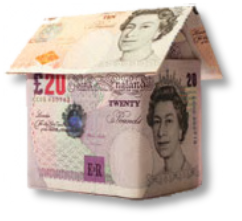 The cash can be used for any purpose and may help first time buyers with moving and legal expenses. There is normally a five-year early redemption penalty that, should you overpay or repay your mortgage, you must also repay the Cash Back. Unless you have a sizable deposit of around 10 - 20% you may find it difficult to get a mortgage. The solution may be Shared Ownership. The government Help-To-Buy equity loan could help new home buyers. It is vitally important that you take steps to ensure your mortgage application is not rejected. Click the link for more on mortgages including fees, charges and advice on making an mortgage application - how to avoid mortgage rejection. Homeowners may need to remortgage at the end of a fixed-rate deal, or to release some of the equity in their property, or simply because there is a better rate than their current deal. Consideration should be given to any early redemption charges if you are leaving a mortgage deal early.